On March 31, 2015, Microsoft announced the Surface 3. It’s smaller, and less expensive than the Surface Pro 3, but it still does all the things that you would expect from a tablet PC that runs the latest version of Windows. The base model is priced at $499, the same price as an entry-level iPad Air 2. So, the obvious question is, can the Surface 3 succeed where other tablets have failed and actually overturn Apple’s dominance in tablet based classrooms? I’ve been lucky enough to be able to go hands-on with one of the new Surface 3 devices, and I am already a seasoned iPad user, so here are my thoughts and first impressions on how they compare. On paper, both devices are very evenly matched. The Surface 3 is a little heavier and a little thicker than the iPad, but it does have a larger screen that will help account for some of that weight. The battery life is identical, as is the amount of RAM in each one, but the Surface has more storage, more ports, and a better front facing camera. 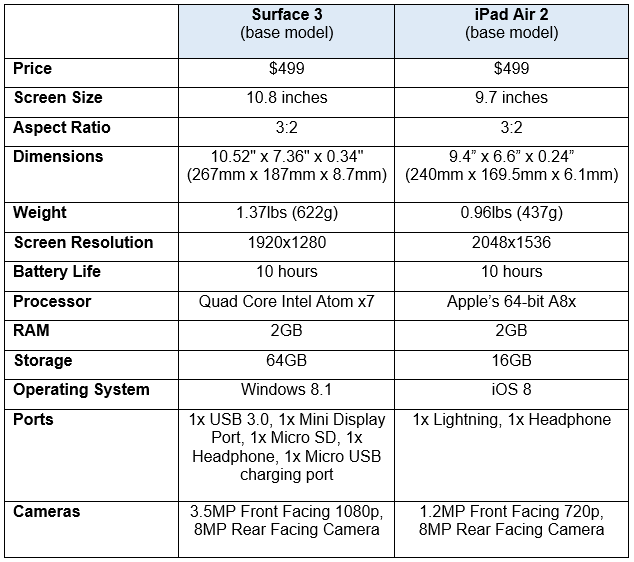 You can see a full comparison of the specs between the two devices in the table below. The device I was sent from Microsoft was a 64GB Surface 3 with 4GB RAM. Of course, spec sheets only tell half the story. After all, if you are thinking of investing in a device like this for your classroom, there are other things you will want to know like how durable will it be, and can you count on it to do what you need, when you need it? The iPad is an extremely reliable device and, in a decent case, it is able to withstand a fair amount of abuse. The Surface 3 is also a great device and is very comparable in build quality to the more expensive Surface Pro 3. I haven’t seen any protective cases for it yet, but I am sure that there will be some released in the near future. One nice feature, is the 3-position kick stand that is built-in to the back of the Surface 3. It makes typing, with or without the keyboard, much easier. If the stand is pushed too far back, or is accidentally sat on, it will automatically detach to avoid permanent damage, and allow you to re-attach it. The iPad has no kickstand, but many third-party cases do offer this option. The iPad has access to thousands of high quality educational apps in the App Store, many of which are designed specifically for the iPad and for use in the classroom. The Windows Store does not have anywhere near as many apps, but, on the flip side, the Surface 3 will run anything on the web, including content powered by Flash or Java. What’s more, it will also runtraditional desktop software like Office, Sketchup, Photoshop Elements, Google Earth and just about anything else that was designed for a regular Windows laptop. Professional software like Adobe Photoshop or Premiere will run on the Surface 3, but performance will not be as good as it is on something like the Surface Pro 3 or a high-end ultrabook which is better equipped to handle such tasks. Almost all of Microsoft’s press images picture the Surface 3 with a keyboard and pen, but it is important to note that it comes with neither. The Keyboard is an additional $130 and the Surface Pen is $50. That takes the base price of the Surface 3 up to $680, but you don’t get a keyboard or a pen with an iPad either and that doesn’t seem to deter schools one bit. So, is the Surface 3 a realistic proposition without a keyboard and pen? In Metro mode, it works really well. Apps and touch gestures are intuitive and designed to work well with a touch device. In desktop mode, it is less of a success. For instance, if you tap in a text field in desktop mode, the keyboard will not appear unless you summon it manually from the system tray. This will hopefully change when Windows 10 (a free upgrade for the Surface 3) is released this summer, but right now the desktop mode works better with the Type Cover. I enjoy using the Surface 3 keyboard. It is a little noisy to type with compared to a regular laptop keyboard, but it feels good and isn’t too small for regular sized hands. 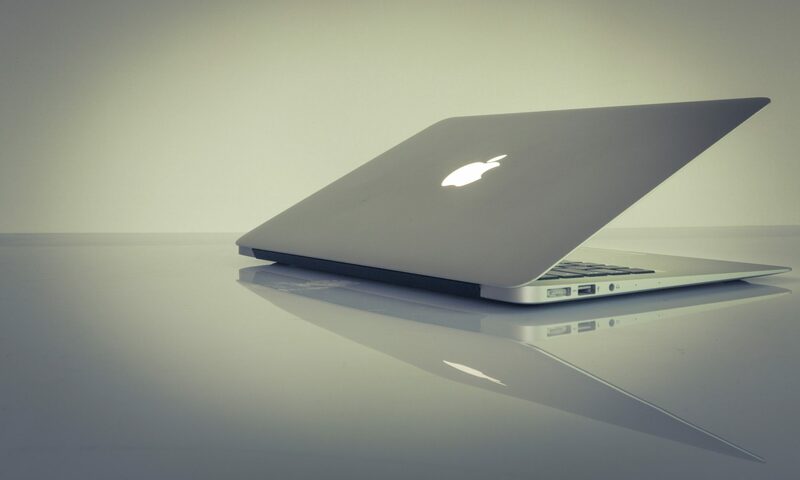 It is backlit with LED lights and has useful shortcut keys for things like screen brightness, mute and play/pause. It can be used flat or angled for better ergonomics. Nonetheless, I didn’t find the trackpad as responsive as I might like, especially with two finger scrolling, but you can easily add a USB or Bluetooth mouse if necessary. So, minor quibbles aside, it is a nice option to have. I am typing this post on the Surface 3 and I hardly notice any difference compared to the experience on a laptop. The Surface Pen is the same pen as the one on the Surface Pro 3. The Surface Pen is no ordinary pen and is not comparable to any iPad stylus. It has 256 levels of pressure sensitivity and a fine point for precision work. The harder you press, the darker and thicker the line is that you draw. It also has a handy button on the top that will automatically launch OneNote with one click, even if your Surface is in standby. OneNote is ideal for handwritten notes, something that current research is telling us is more effective than typed notes. In addition to OneNote, Fresh Paint is an app that is ideal for the Surface Pen. It will quickly bring out your inner artist and would be great for sketchnotes or other drawing projects. When the pen is active, it is the only thing that will make a mark on the screen. No onscreen wrist guards or other adaptations are necessary. The pen is available in blue, red, silver and black and is powered by one AAA battery and two watch sized batteries. The Surface 3 is a more affordable version of the Surface Pro 3. As such, it is being marketed as an ideal device for schools, and in many ways it should be. The Surface 3 is light, portable, it has a front and rear camera, and it runs on a flexible operating system that will run one of the largest software libraries available to any device. In the summer, there will be a free update to Windows 10 that will include specific optimizations for hybrid devices like this. So, look for the Surface 3 to become even more capable than it is right now. The build quality is excellent, it has a great, full HD display, and a battery that should easily last a full school day. However, as with all new devices there will always be some question marks. For instance, how well will it run three years from now, (as it will likely need to in a budget conscious school environment)? Will the keyboard and pen (and pen battery life), hold up to the rigors of classroom use? Will schools be satisfied with just the tablet version at $499 or is the $680 version with the Type Cover and Surface Pen needed? Will the app ecosystem develop enough educational apps to compete with other devices or will the web suffice? Personally I really like the Surface 3. I can’t answer any of the questions above because I can’t predict the future. However, I can see a lot of potential in this device for use in the K-12 classroom and I know there are many teachers that would understandably love to get a device like this into the hands of their students. Are you intrigued by the new Surface 3? Do you have questions that have not been addressed in the review above? If so, feel free to leave a comment below and I will address as many as I can. As with all iPad vs anything, I think this will still come down to the App Store being better than anything else. For the past several years, developers constantly have been designing educational apps for the iPad. Even with the ability to run some traditional desktop software, it will take a few years (and probably a change in heart from developers) for a windows to be comparable to the App Store. Yes, you may well be right. Windows 10 will offer developers the possibility to develop one app and have it run on tablets, PCs, phones, and even the xBox so that might help with some of the disparity, but Apple really does have a big head start and Microsoft are doubtless well aware of that. In some ways these are similar devices, but in others they are not, so it will be interesting to see how well the Surface 3 sells. Thank you John! And a last suggestion : Surface 3 vs Galaxy Note Pro 12 (always about handwriting) ? Sorry. Can’t help you with that one. I have not used the Galaxy before. I think they are very comparable. Unless this is the only thing you would use the device for, I would also look at other use cases to help you weigh up the pros and cons.